Hello Alums! Here's what going on along the breezy shores of Kenlake! We have a jam packed schedule this year filled with competitions! To start, we competed at TN Indoors in January. Our women dominated the field - 1st place finishes in both Novice and Varsity 2k races, and a clean sweep (1st through 4th) of the 500 m dash. The men also did well, placing in the top half of their respective races. Carter Jones, our men's coxswain, won the Coxswains Sprint for the second year in a row. March 31st: Clemson Sprints in Clemson, SC. April 14th: Wash U Invitational in St. Louis, MO. April 21st and 22nd: SIRA in Oak Ridge, TN. May 12th: Scrimmage at Wash U in St. Louis. May 26th: ACRA in Gainesville, GA. 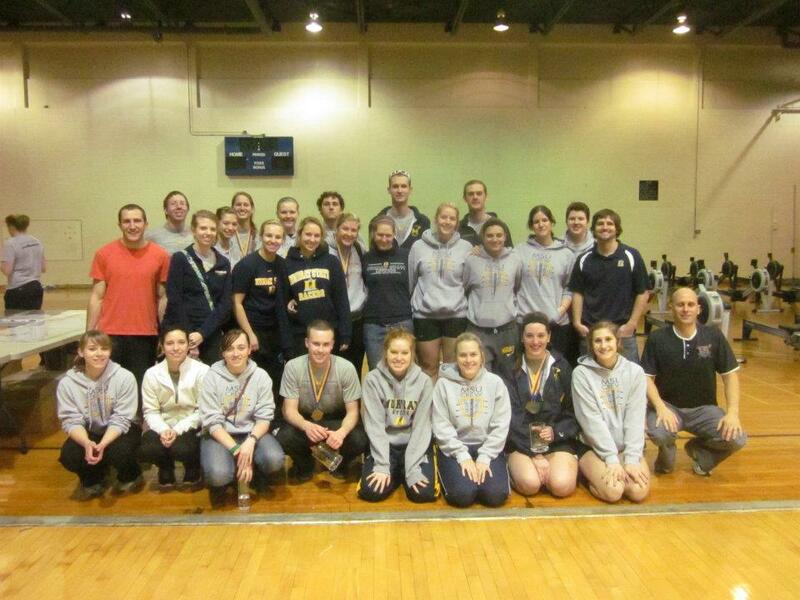 The team at the 2012 Chattanooga Indoors. And Dan. We are finally returning to the extended after school schedule by competing in May. That also allows us to skip John Hunter this year: It falls on the weekend of Spring Break. We are not training over spring break as well - to go somewhere would be too expensive, and to then travel to John Hunter from that location would result in something of a logistical nightmare. It should also be noted that Vandy is not attending JH Regatta either. With that said - the last group to talk about is the team itself. As I said earlier, our women's team is doing incredibly well. We expect a great performance from them this spring, and we are certainly on track to build strong, consistent, four year rowers out of all of them. Allison France is still our women's captain, and is doing a tremendous job at leading them. We lost very few women over the span of winter break - their numbers are slightly lower than that of the fall team. The men's team is also well, but in a slight conundrum. Our numbers are... small. We have 4 varsity (1 being a coxswain) and 3 novice. The recruiting efforts this spring have not been as successful as envisioned, but we are working to fill out the remaining seats. Of the rowers we do have, all are very committed and very strong, with 2k splits into the low/mid 1:40 range (excluding myself, of course). On top of that, these 12k's are really moving the men in the right direction - our sprinting ability is certainly there. That's about it! We hope you are all doing well, and we should also remind you that we have a t-shirt fundraiser that is starting and we would love to sell you gear! If you'd like more info email msu.rowing@murraystate.edu for more info. Also, please invite all your fellow alums to this site! We want to build an even stronger alumni base!